Bambi’s new Moodmaker Superior Alpaca Fleece Quilt is the pinnacle of comfort and luxury. 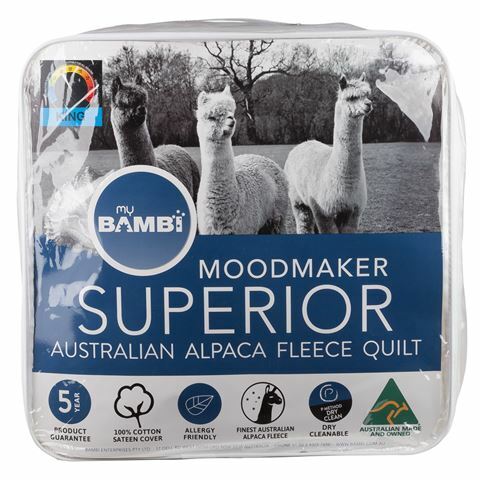 Featuring a cotton sateen cover, this quilt is filled with the finest Australian alpaca fleece that’s not only incredibly soft and lightweight, its naturally allergy friendly and designed to keep you warm and comfortable all year round. Cover is crafted from cotton sateen. Filled with Australian alpaca fleece. Alpaca fleece is naturally hypo-allergenic and almost completely waterproof. P method dry clean recommended. Dimensions: 245cm (l) x 210cm (w).